Thinking to design a photo calendar with your own photos? Designing a calendar with your own photos is a fun. If you gift this calendar to your friend with his photos, this will be an unexpected gift. You can do this with Microsoft publisher tool. But you ed to purchase Microsoft office suite. 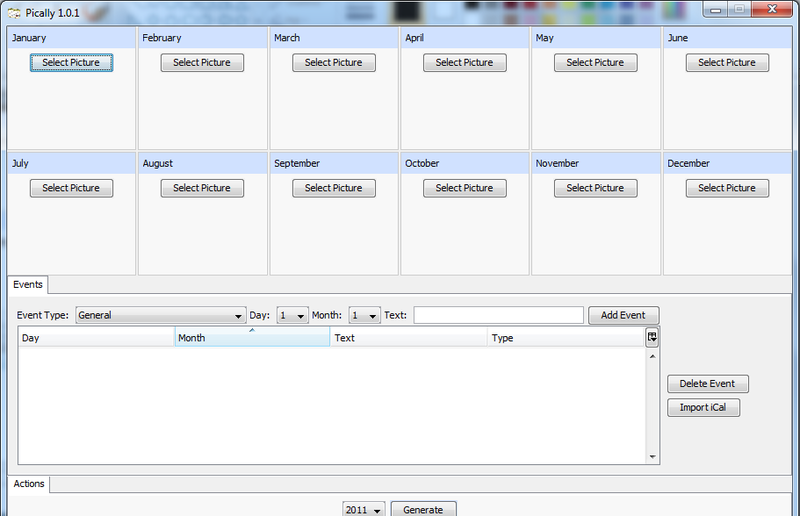 You can create a calendar with Pically. It is simple and easy to use. This Java based tool is available for Windows, Mac and Linux. Pically is a nice tool that allows users to select photos for each month, add holidays and special occasions and then print the calendar. As we know that the tool is based on Java, you need to install Java on your system before using the tool. It is a portable app so you can carry it with you anywhere and use on any system having Java installed. Once downloaded, run on your system. It has a simple interface which says everything clearly. You will find 12 boxes on the top, one for each month with a button to select Picture. Click on this button to add a photo for that month. At the bottom of the tool, you have the option to add a special event to the calendar. Select event type, day, month and text to display on the event. You can add anniversaries from this section. In this way, your calendar will remind you all birthdays which you generally forget. At the right side, you will also find options to delete the event. If you are using this tool on MAC, you can upload iCalendar files containing appointments and engagements via the ‘Import iCal’ button. After customizing options of the calendars, click on the Generate button to create your calendar as PDF document. Pically is a simple and fast tool to create the calendar. Currently it allows users to create calendars of years in range of 2011 to 2015. It is free and portable tool that is an extra advantage of using this tool. Use this tool and share your views with us via comments.